In the last couple of years Modi government has taken large no. of steps towards development. A set of schemes has been introduced time to time to provide various aids to the people. In June 2016, the government has come up with another scheme called PM Surakshit Matritva Yojana for the pregnant women. It is about free medical check up for the pregnant women who need a regular check up. District hospitals, private clinics, nursing homes will also be involved under this scheme. This free medical check up includes basic health checkups like BP, Sugar, Weight, and Blood and so on. People who are economically backward will be eligible for this scheme. It is necessary for every pregnant woman to live a healthy life. This scheme is to provide access to regular health checkups to them who don’t have regular access to the medical assistance. This is a free medical check up program for the people who are unable to go for regular check up due to financial issue. Regular check up will make them aware about mother as well as baby’s health. The scheme is aiming to provide a training program to the mothers who have no idea about how to raise children. The program will give them proper education where they can be aware of health and upbringing of the new born. The scheme is to detect every single health issues a pregnant woman may suffer from so that they can be sent to concerned doctors for further treatments. The scheme is introduced by the government of India. According to the appeal by the central government, the free medical check up will take place once in every month. The date is fixed by the government. The 9th day of each month the medical camp will be held in government hospitals and medical centres. Under the scheme all the government hospitals and medical clinics will arrange a free medical check up program for the pregnant women who are in their early stage of pregnancy. The medical free check up includes BP, Sugar level, Weight, Haemoglobin, Regular Blood reports and other health issues a woman can have during her pregnancy. Women need to register their names under the scheme at first. There will be a medical card issued to each patient. After going through all the checkups the reports will be recorded in that card for further treatment. 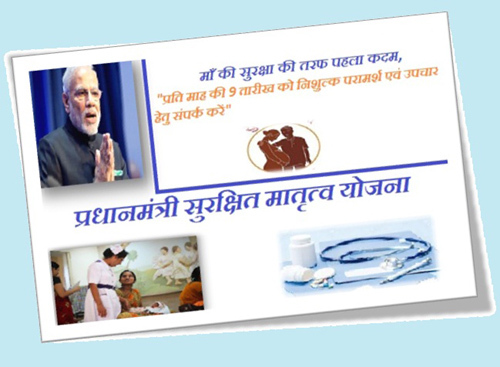 As per the scheme each patient will get a unique card to record their issues. After recording their reports they will be given different coloured stickers to mark the specific patients. It helps to lowering down the probabilities of getting complications during early stage of pregnancy.